The protection of our members’ privacy and the safekeeping of confidential information is of utmost concern to the Credit Union. It is the Credit Union’s intent to comply with all applicable laws and regulations concerning the treatment of both member and non-member information, and educate our member as to their privacy rights under law. This policy outlines the purposes for which member information will be collected and released outside the Credit Union. The procedures in this policy implement the privacy practices disclosed in the Lakeview Federal Credit Union Notice and Privacy Disclosure Statement. The Credit Union will only collect information necessary to establish a relationship and provide products, services and opportunities to its members, non-member customers and consumers who come in contact with the Credit Union. Information on an individual member may be collected from a variety of sources, including the member’s signature card, loan application, and credit bureaus. Furthermore, the Credit Union will take reasonable precautions to protect the accuracy and reliability of member information. The Credit Union will not sell non-public personal information on its members to any third party. The Credit Union may disclose non-public personal information about an individual member or members with member consent, in order to effect a transaction, to protect the Credit Union’s interests, or for other purposes permitted by law; or to effect, administer or enforce a transaction. The Credit Union may also disclose information to companies that perform marketing services on its behalf or to other companies or financial institutions with which the Credit Union has joint marketing agreements. 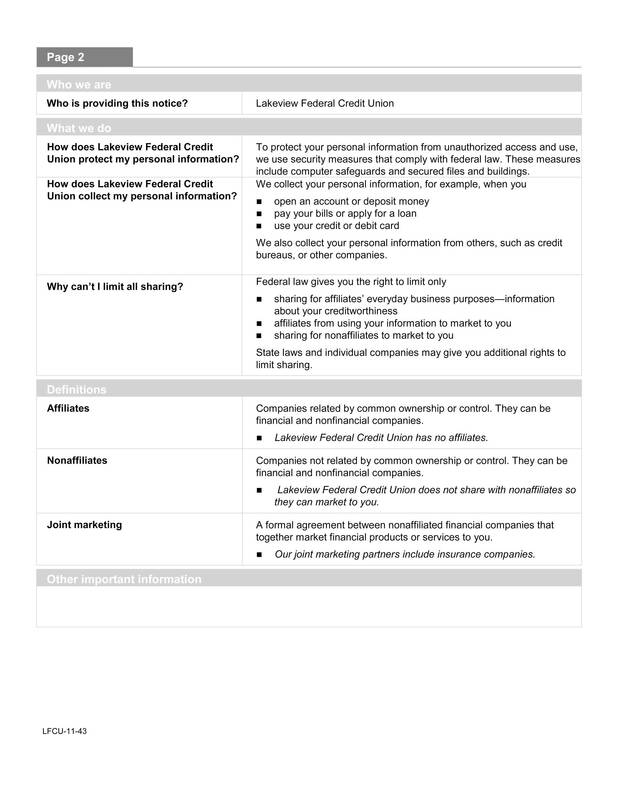 Pursuant to Federal Law and Regulation, any information provided to a third party by the Credit Union, including non-public personal information about a consumer, is provided only to allow the third party to perform the services necessary under the contract, to process and/or service a transaction, or as required by federal/state law and/or regulation. 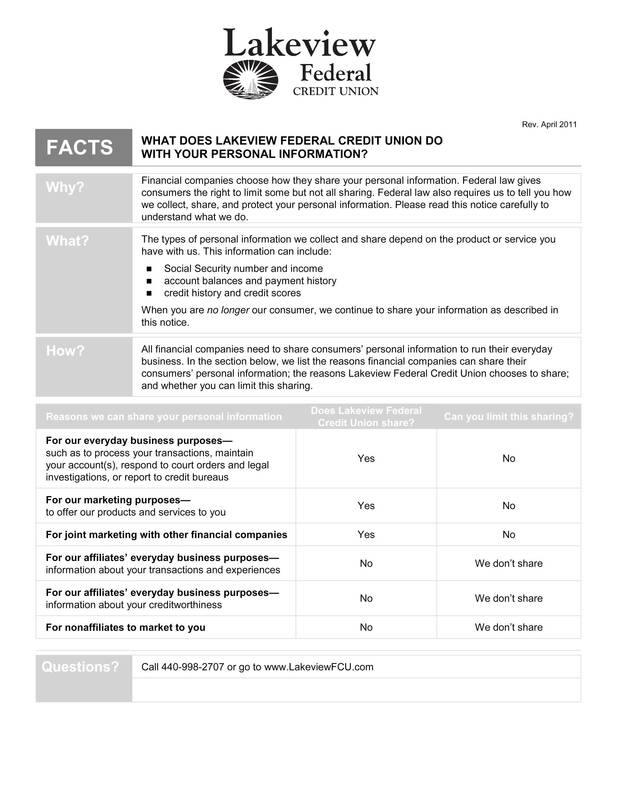 Once this information is received by the third party from the Credit Union, whether it is directly or indirectly through an affiliate, the third party may not disclose it to any person that is not affiliated with either the Credit Union or the third party, unless the disclosure would be lawful if made directly by the Credit Union. Your savings at Lakeview Federal Credit Union are federally insured to at least $250,000 and backed by the full faith and credit of the United States Government by the National Credit Union Administration, a U.S. Government Agency. We will NEVER solicit information from you via e-mail. Unauthorized access or use is not permitted and may constitute a crime punishable by law. Lakeview Federal Credit Union is not liable for content or availability of third party linked sites. Privacy and Security policies of third party linked sites may differ from those of Lakeview Federal Credit Union. Accessibility – Lakeview Federal Credit Union is committed to providing a website that is accessible to the widest possible audience in accordance with ADA standards and guidelines. We are actively working to increase accessibility and usability of our website to everyone. If you are using a screen reader or other auxiliary aid and are having problems using this website, please contact us at [email protected]. All products and services available on this website are available at Lakeview Federal Credit Union offices or by calling (440) 998-2707.